“Music and Questions” is such a beautiful, meditative and wonderful piece. Carol Robinson’s voice and Tom Johnson’s bells are just the perfect combination. We just go into a flow of thoughts and music. Very delightful to listen to it half-asleep in bed before standing up. I’m not always able to recognize all mistakes in ‘Music with Mistakes’, as I start to follow the music just for what it is and enjoy the ‘mistakes’ as incorporated part of the music without bothering about them. That’s is something that is not always obvious for me. I know you consider the idea of mistake from the point of view of a rational procedure. But by listening to it I’m not always aware of this rationality and sometimes accept the ‘mistakes’ without any problems. They become more of a ‘small particular detail’ rather than a ‘mistake’. I have listened to Dante’s live performance of ‘Same or Different’ before. There is a difference when you are listening among an audience that has to react actively after each couple of phrases. The experience by listening to the CD doesn’t force me to think about that issue all the time and consequently I tend to listen to the pair of phrases and the complete piece as a whole. Very nice feeling though. The image I have from the piece is like looking at an object and then looking at the reflection of the object in a mirror. It is the same but different. Tom Johnson’s music is very much like magic. I don’t mean necessarily that his music is magical more that his music works in the tradition of close-up or “micromagic.” As is often the case in close-up magic, the magician is telling you in no uncertain terms what he/she is doing without ever really revealing HOW any of it happened. The end result is a compelling “I can’t believe that just happened” experience and this is the area that Tom Johnson’s music occupies. 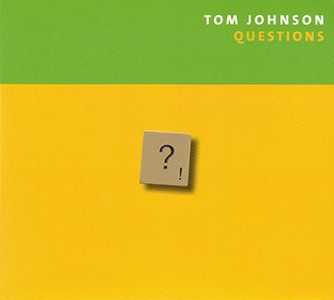 Music and Questions is a prime example of how straightforward Johnson’s music can be. Five bells, all arranged in half-steps, are played in every possible permutation of single strikes. Between each permutation, Carol Robinson asks a simple question. The questions always relate to the listener’s experience of the piece and how the listener relates to the questions or the music. She also announces each section by stating which of the five bells are being struck first. That is it. For 23 minutes. No rhythmic motive to trace, no groove elements, no fancy orchestrational tricks, no surprise emotional outbursts, just a clinical exploration of 120 bell tones. It might be cliché to refer to this as a Zen listening experience but I honestly have no other words for it. There is absolutely nothing boring about this music but my brain tells me the music should be boring. That is the magic. Music with Mistakes puts Robinson in the role of narrator and basset horn soloist. Listener engagement is key with Johnson and Music with Mistakes brings foreground listening to an audience that might otherwise expect to “zone out” during a typical process-oriented “old school” minimalist piece. Instead of the constant interruptions for questions, though, Music with Mistakes starts with the statement that melodic material will be played multiple times but only once without mistakes. The listener is to try to hear the mistakes. Arts organizations are constantly looking for ways to “engage the audience” with their repetitive concerts of warhorse literature. Johnson builds audience engagement into each piece. That is the magic. What is even better is that Johnson includes the answers at the back of the liner notes. Same or Different operates under a similar basic principle as Music with Mistakes. Thick piano chords are played but the underlying question is: are they the same or are the different? A motive is played and the repeated: are they the same or are the different? This game lasts for about 27 minutes and it is some of the most active listening I’ve done in a while. Since the music is, at its core, so simple and direct it is hard to say anything about the performances. Is there a word for this kind of virtuosity that puts the performers in a quasi-game where their detachment is a the primary fundamental skill? In the last two pieces, Carol Robinson and Dante Boon have to play their pieces without giving anything away. They have to make micro-changes and repetitions into a cheeky game of “did I or didn’t I” for considerable lengths of time. Not only is Johnson inviting the audience to hyper-scrutinize each micro-motion of the performers he also gives them an extremely thin veil to hide behind. The whole disc is a delight to listen to. That is magic.